Please note that this review is primarily experience based, rather than being based on technical specifications and performance. I'll touch on the aesthetics, the tactile feel, and the actual usage, but not on any kind of performance benchmarks. This review is intended for average consumers, rather than the savviest of techies. Review units provided by Cougar. 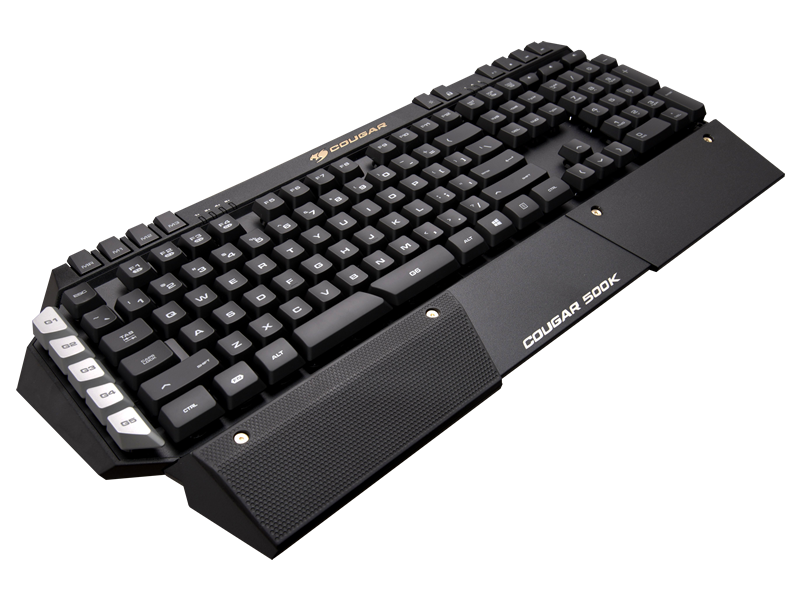 The Cougar 500K keyboard is a bit of a behemoth, primarily because of the addition of the G1-G5 keys on the left. Though highly useful in practice, it does create a bit of a space problem in all but the most open of computer setups. 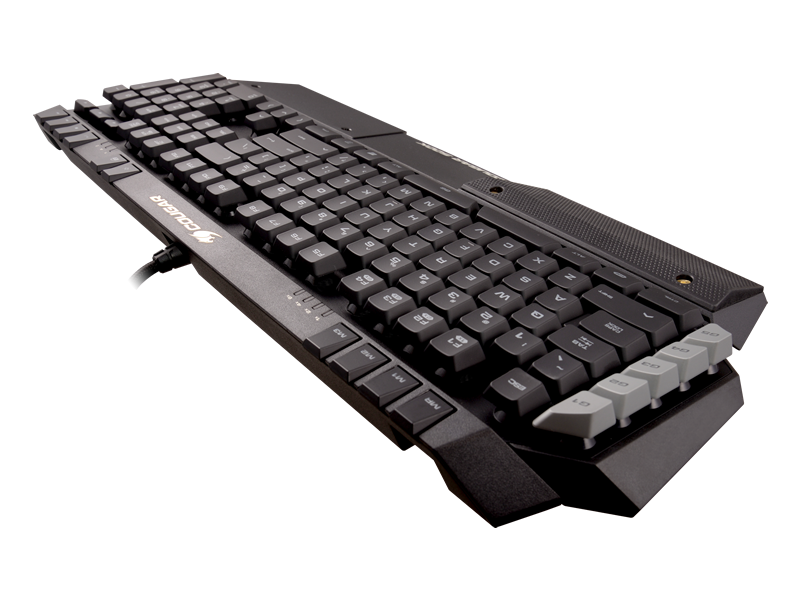 The functionality added in using the G-keys as single-button macros is incredibly useful, no doubt, but if you've got limited real estate on your work/gaming area, the G-keys in addition to the various additional keys on the top of the keyboard give it a fairly large profile. 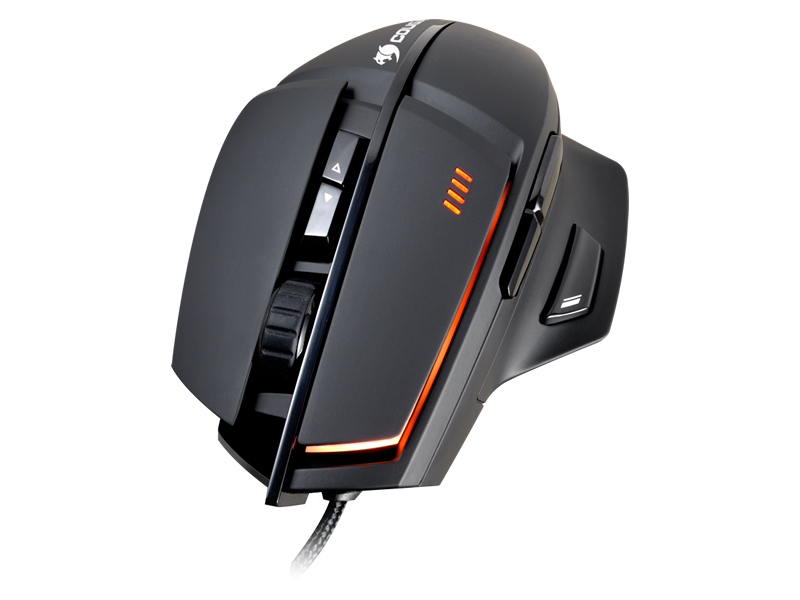 Other than the massive profile, the 500K is an incredibly slick-looking peripheral. 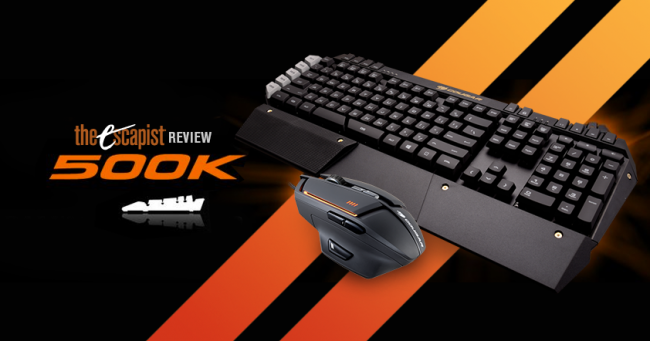 The silver G-keys and orange backlighting contrast gorgeously with the various blacks of the keyboard itself. 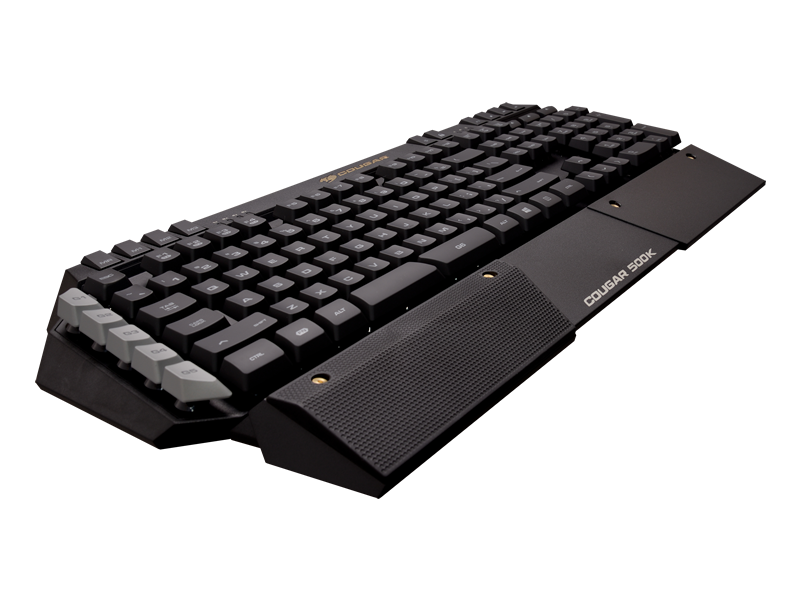 The keys are elevated, as you might see on a mechanical keyboard, though it is itself a membrane keyboard. The braided twin USB cable (one for the keyboard and one for the USB passthrough) is easily distinguishable, though it is a bit stiff and retains its packaged shape for weeks, which is sub-optimal, aesthetically speaking. 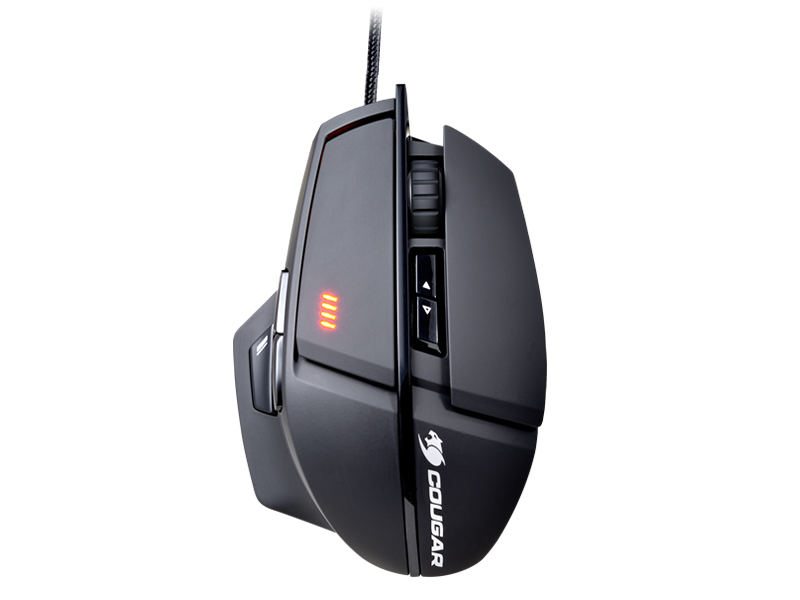 In contrast to the behemoth profile of the keyboard, the Cougar 600M gaming mouse is perfectly sized for a limited play area. 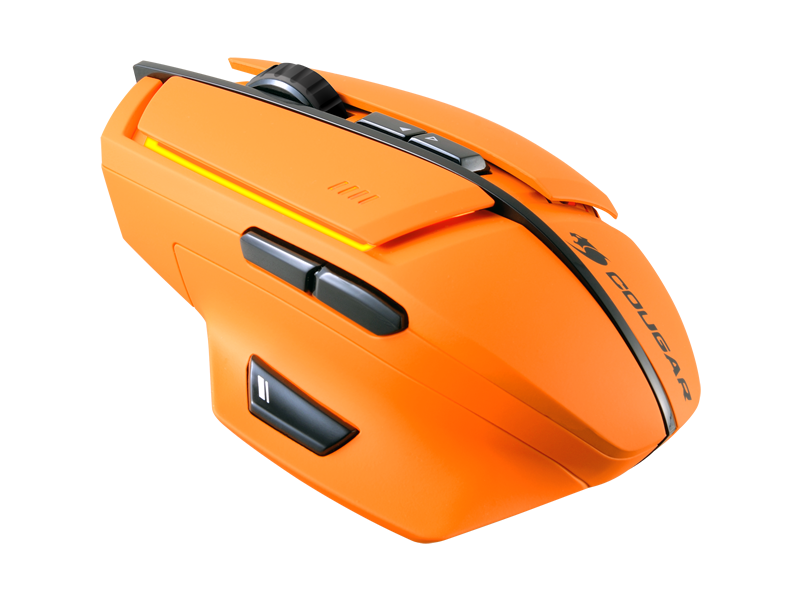 I received the orange-colored version of the mouse, which, like the keyboard, contrasts nicely with the dark black, and the customizable lighting can take on virtually any color you can imagine. 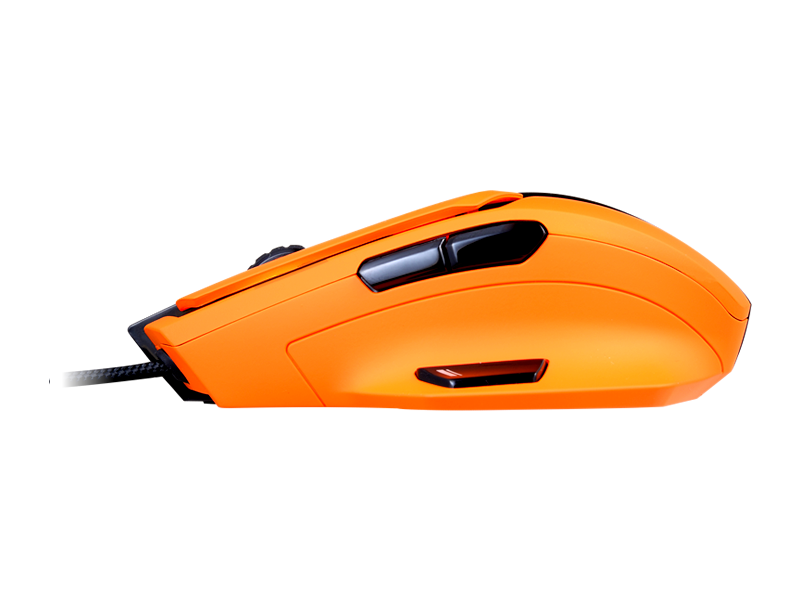 With a lithe body and distinct, contrasting colors, the Cougar 600M stands apart from many a bland peripheral in the best way possible. Even the braided cord is less stiff than its keyboard counterpart, making it much easier to wrangle alongside many other cables and cords. 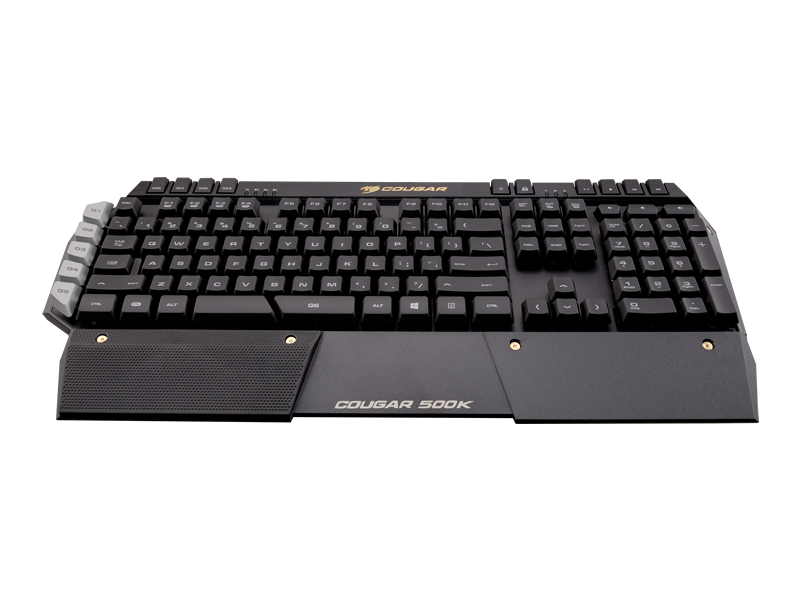 The Cougar 500K Keyboard's elevated keys, which make it look akin to a mechanical keyboard, do lack the oomph of a non-membrane key press. 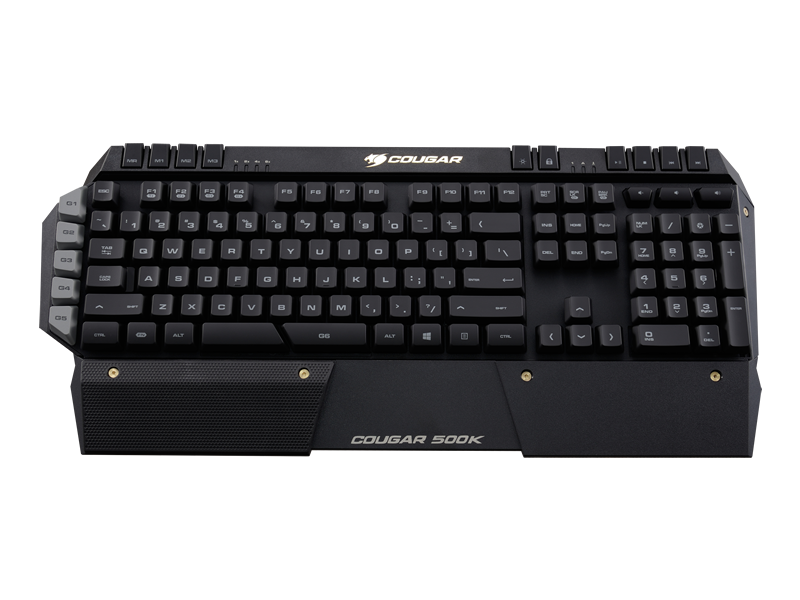 Though it requires slightly firmer presses than your typical membrane keyboard, lacking the clak-clak of the mechanical keyboard - which you'll expect from looking at it - is a bit of a letdown. 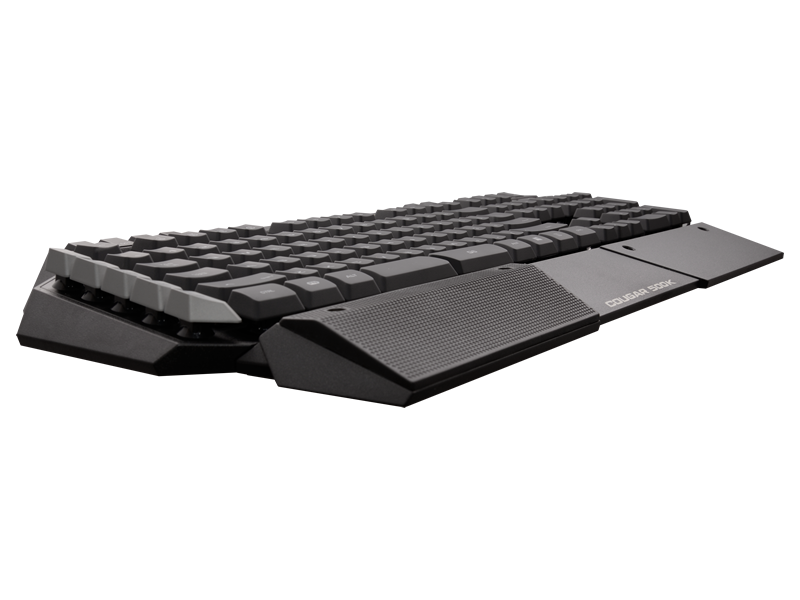 The left-hand wrist rest is nicely textured for comfort, but it does add a large margin to the already-hefty profile of the product. 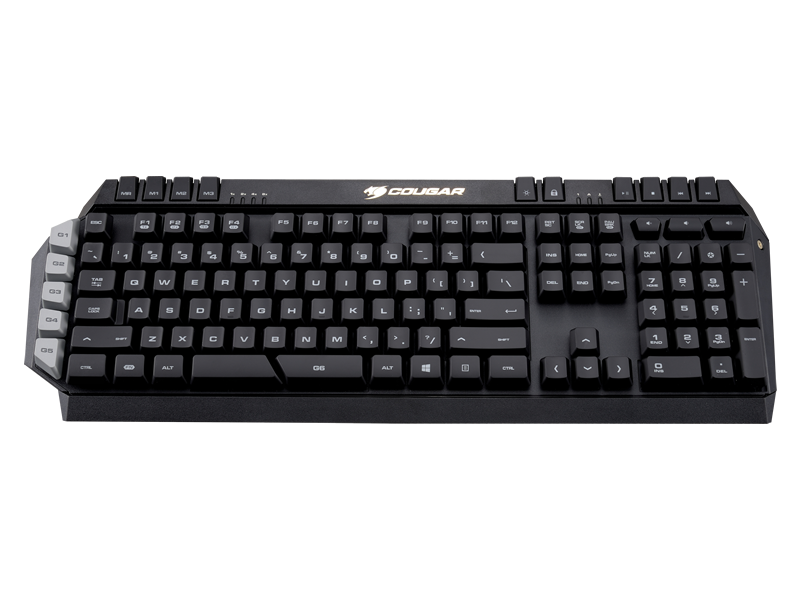 The standard keys are smooth plastic, but the keys along the top have a near rubbery texture, which offers some grip. 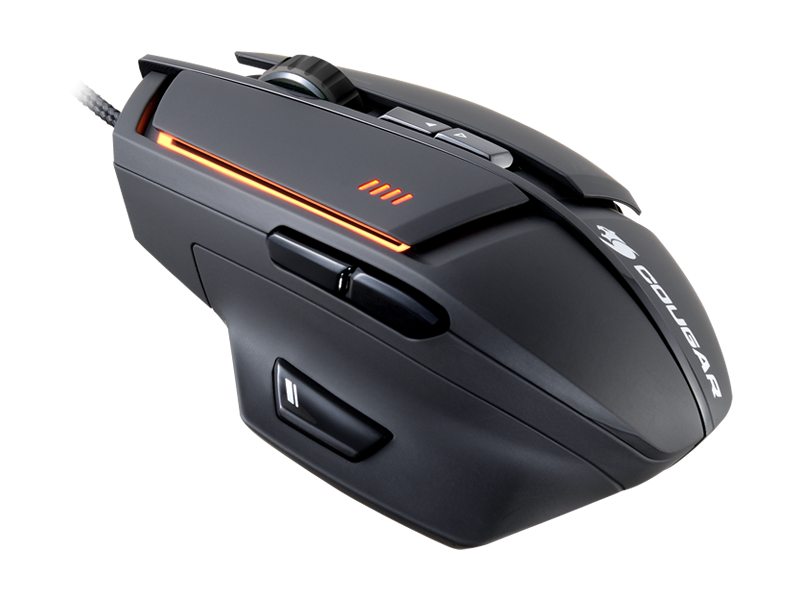 The tactile experience of the Cougar 600M Mouse is practically perfect. It nestles snugly in the palm of your hand, while your thumb rests on the 45-degree Sniper button. 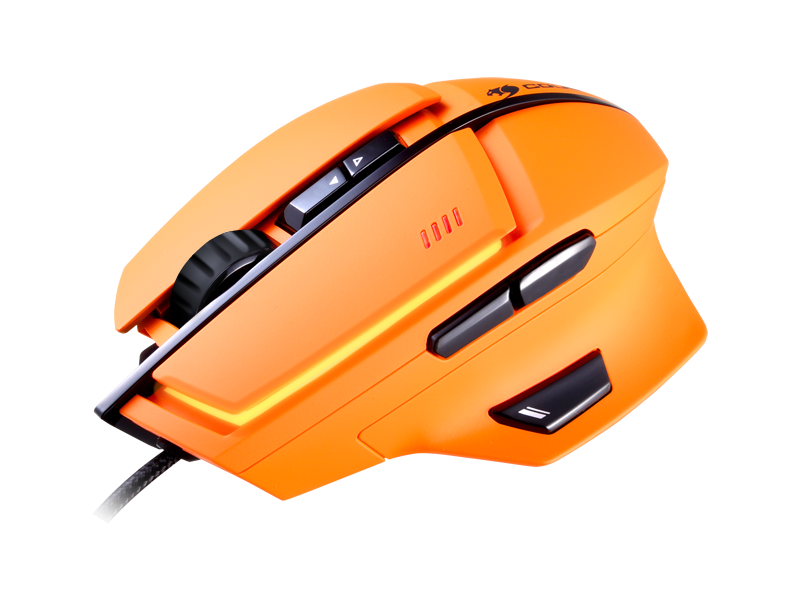 The easily accessible mouse speed ranges from ultra-slow to incredibly fast, with either end of the spectrum being largely useless for day-to-day activities, but for precision or quick action they may come in handy. 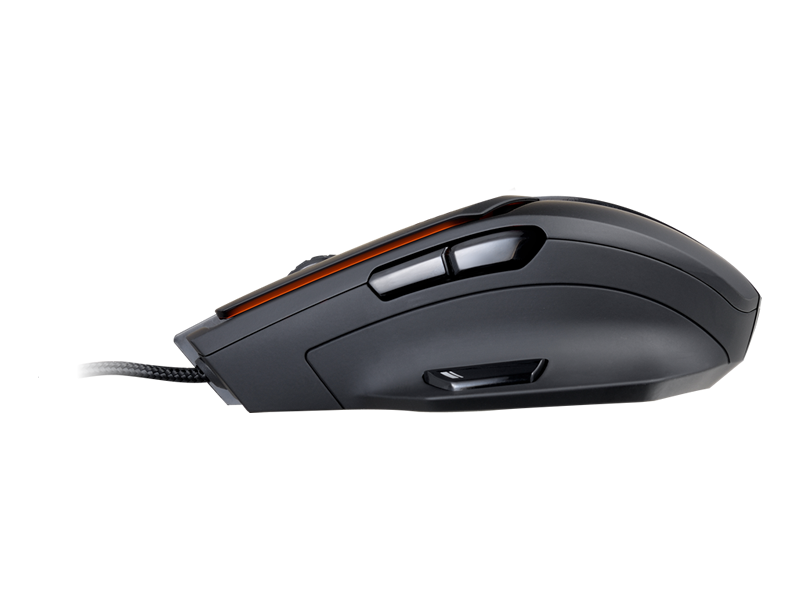 The 600M has an incredibly comfortable matte finish and glides easily across the mousepad, picking up even the most minute of movements. 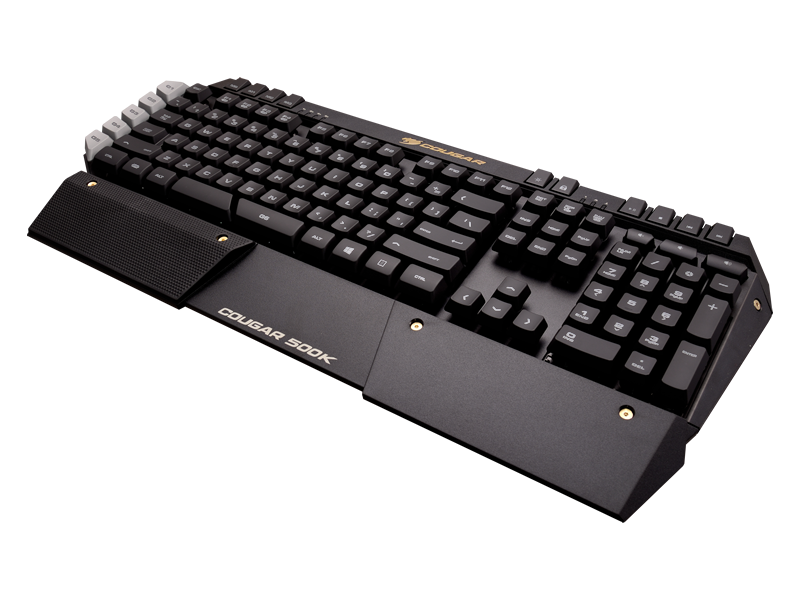 The Cougar 500K Keyboard is stellar for both gaming and productivity. 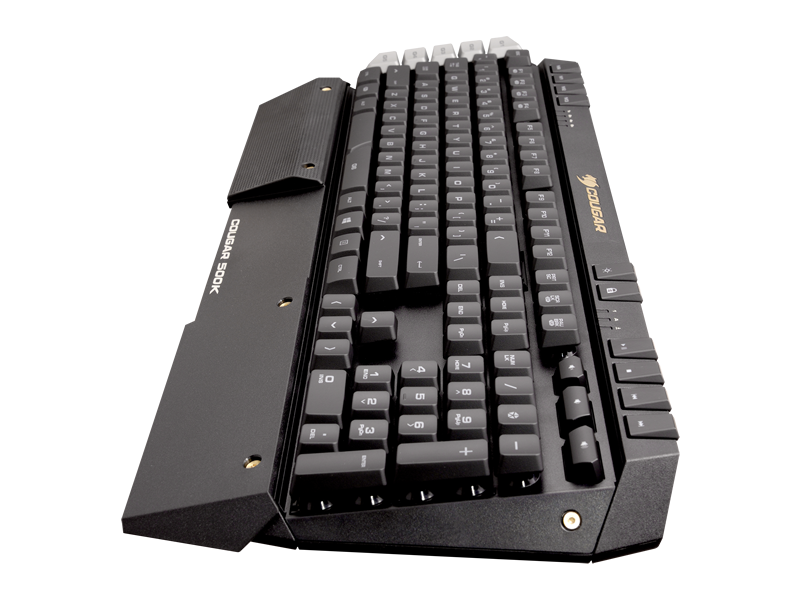 Macroing the G-keys can make starting programs or repeating frequent tasks a breeze, and the player controls for music and movies, though out of the way (above the numpad) also allows for better multitasking. Despite being an overall really solid addition to workplace and gaming space productivity, there are a couple of very minor concerns that should be noted. 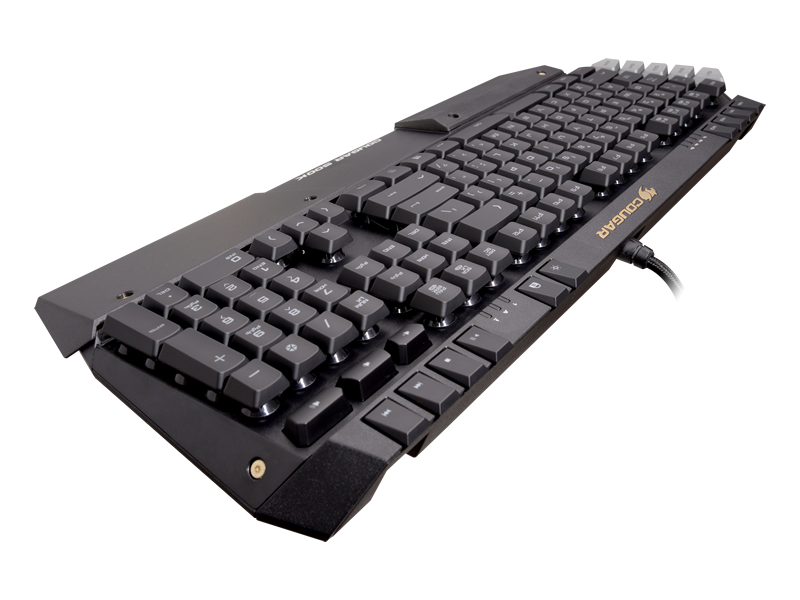 First and foremost, the G-keys along the left-hand side of the keyboard can get in the way of the Esc key, if you're accustomed to tracing the keyboard to the top left corner to press it. Lowering the G-keys slightly would go a long way to resolving this particular gripe. Similarly, the split spacebar can be really frustrating if you're a right-hand spacer like myself, at least until you figure out the UI that allows you to bind both halves of the spacebar. 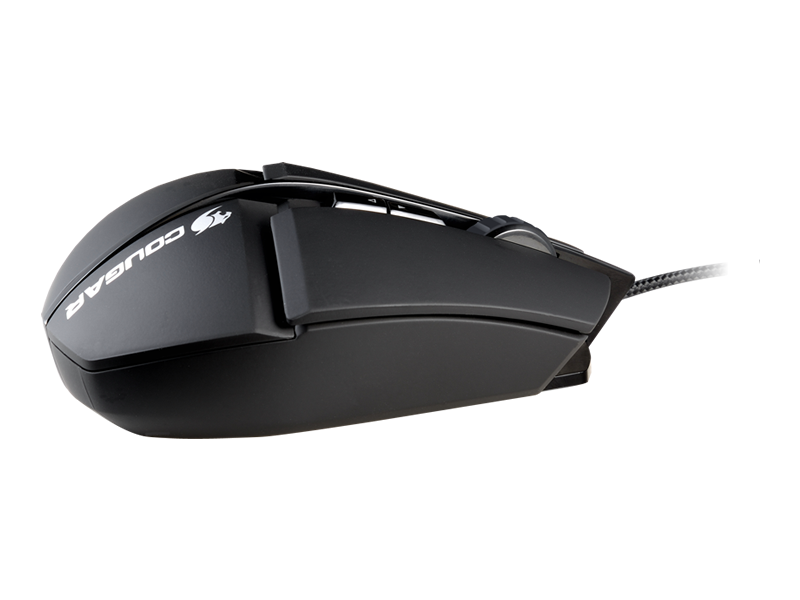 The 600M is practically perfect for usability. 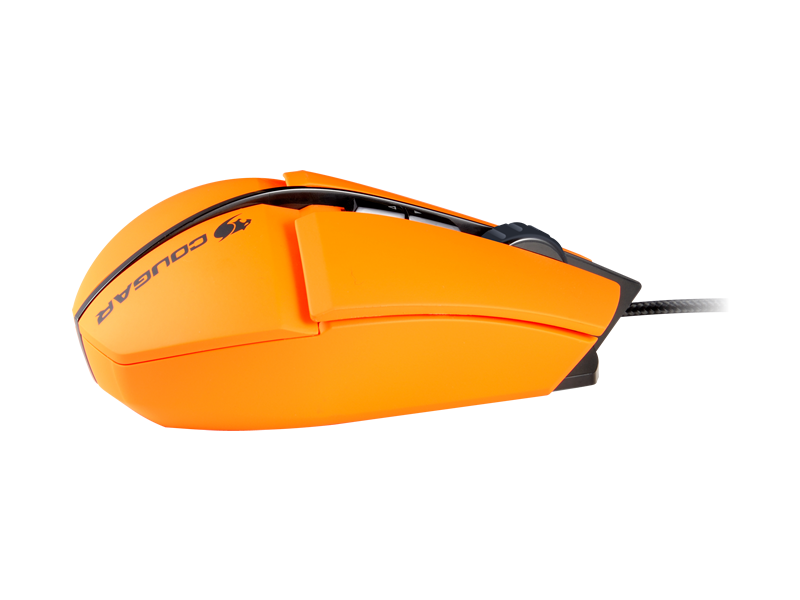 It glides easily, tracks perfectly, and the speed settings are easily accessible for fine tuning on the fly. 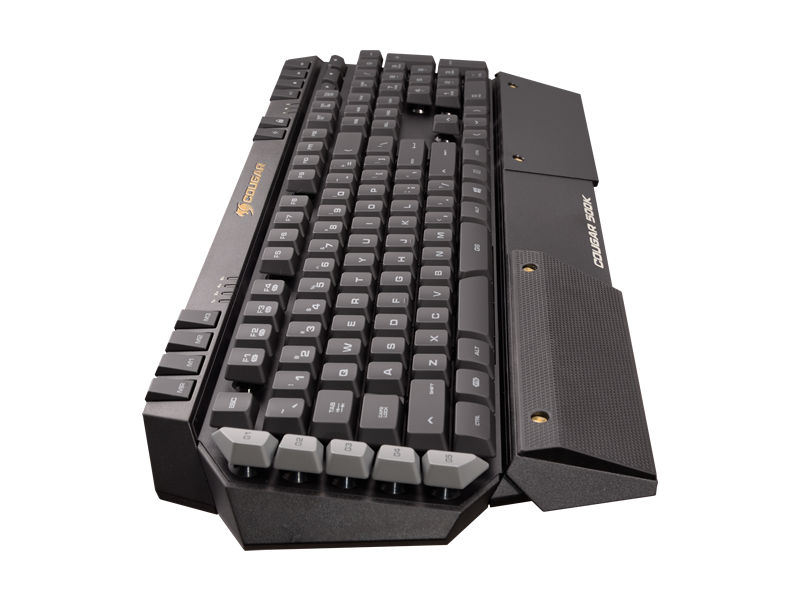 There are advanced functions available in tandem with the keyboard that allow you to switch your mouse settings on the fly via keys on the keyboard. 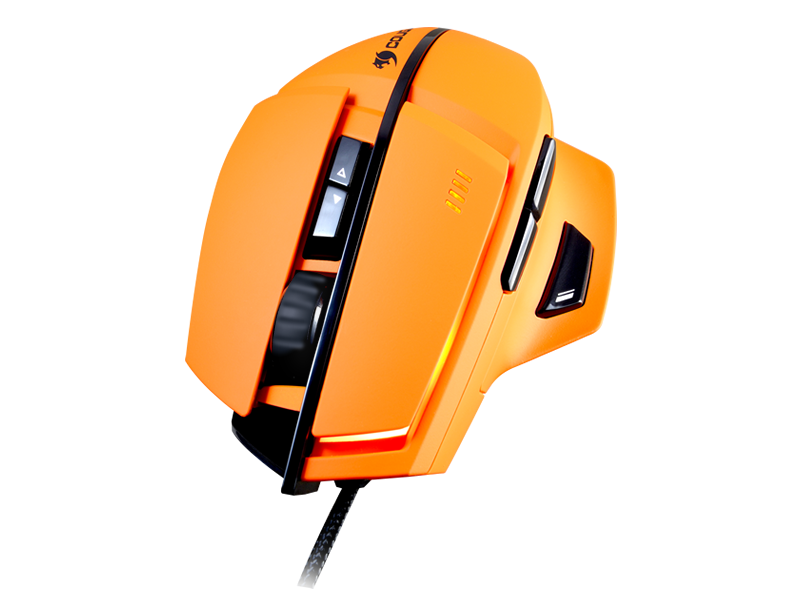 The buttons are perfectly weighted to ensure easy clicking without frequent mis-clicks. Every button is easily accessible, and the braided cord is durable and flexible. 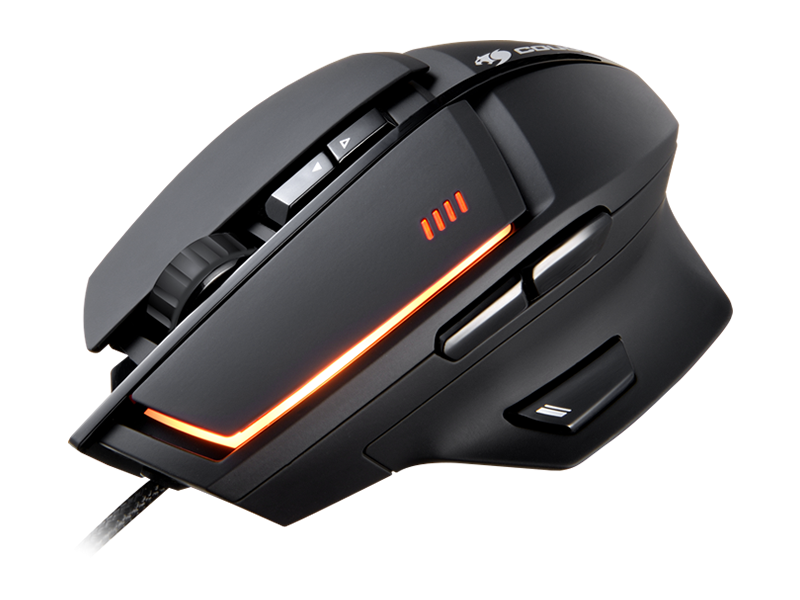 Both the Cougar 500K and 600M are stellar additions to your working or gaming station, though the mouse is definitely the frontrunner in efficient use of space and general ease of use. The Cougar UIX - the program used to set up macros, color schemes, and more - is, for the most part, intuitive enough, though some of the more complex features may leave new users a bit befuddled. 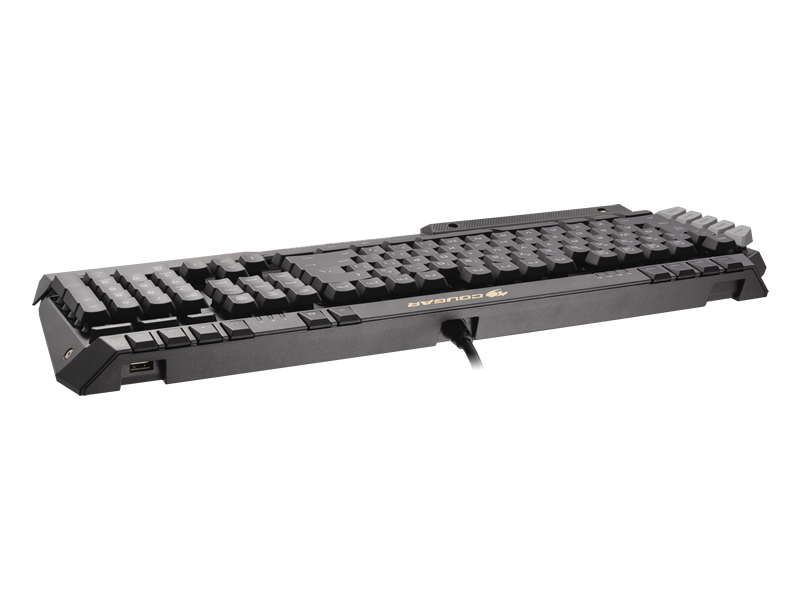 Though the 500K lags a bit behind the 600M in terms of comfort and space efficiency, there are some huge boons to productivity in the G-keys and their macro ability. Both have incredible aesthetics to them, however, especially if you're not working with limited real estate. Despite the exemplary product, the $80 price point on the 500K is a tad higher than you might pay for similar devices. At just under $60, however, the feature-rich 600M seems to offer a much greater comparative value. 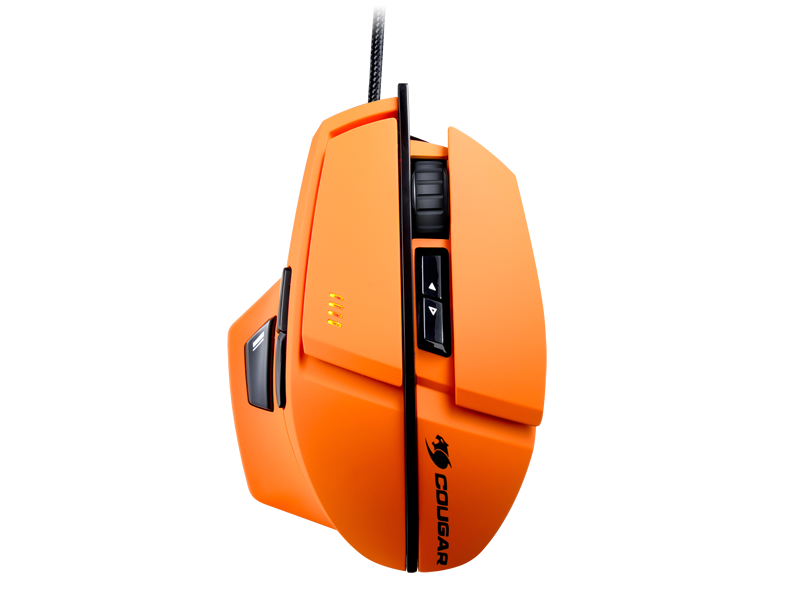 Disclaimer: Review units were provided by Cougar for both products reviewed.